For birdwatchers, monsoon is cuckoo-season! Easier heard than seen, cuckoo songs can be quite a puzzle to solve for the novice. Cuckoos become vocal during late summer and monsoon because this is the time they seek mates and breed. This also coincides with the breeding seasons of their host species, such as prinias, tailorbirds and babblers. Coucals however, make their own nests. 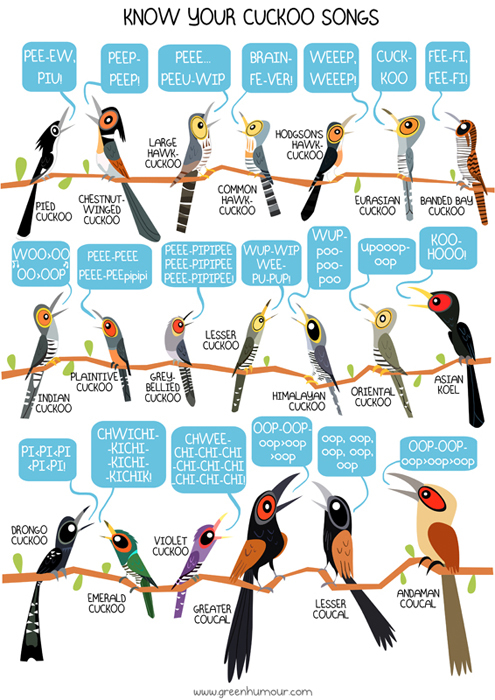 Here is a sing-along cuckoo chart that would help bird lovers with some quick on and off-field differentiation. (Please note that Malkohas have been left out because they are rarely vocal). The prints are available as A3 size posters and coffee mugs that can be ordered by e-mailing me on rohanchakcartoonist@gmail.com (mentioning the number of prints, your postal address and phone number). For orders outside of India, prints can be purchased from my online store here. Oh, and as I share this with you, a Grey-bellied Cuckoo puts up a concert in my backyard!